This demo is by the talented James Stringer. You can hear more of James's stuff on his SoundCloud page. The Commodore 64 Synthesizer Sessions Deluxe are a unique collaboration between Rhythmic Robot and those nice people at Bedroom Producers’ Blog. Tomislav, the guy behind BPB, is an avid SID chip enthusiast, and spurred on by the annual KVR freeware competition he pulled out all the stops to sample a treasure trove of crunchy Commodore patches. There are 30 patches in the library, sampled from three different iterations of the Commodore 64 home computer. 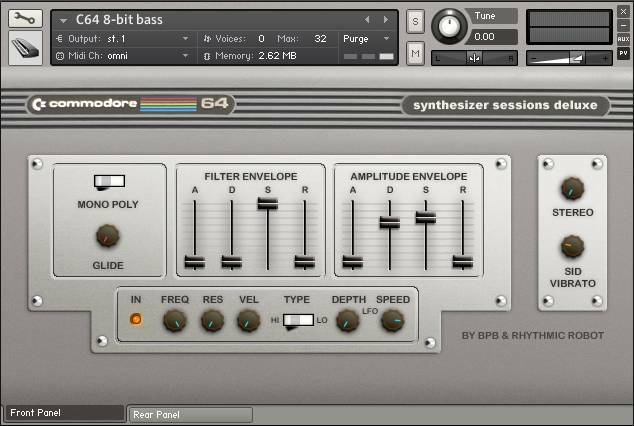 Mongo rolled up his coding sleeves and put a Kontakt UI on the front, and the result is a neat little library of old-school lo-fi grit, with enough flexibility to let you roll your own SID sounds into the bargain.